Insignia of the Inquisition, 1574. The mandate of the Catholic Church's inquisition was to stamp out heresy. Although empowered to impose sanctions that included torture and execution, such extreme measures were not imposed casually. Typically, they operated within communities as an extra layer of bureaucracy. Nevertheless, the Holy Office of the Inquisition was not an organization with which to trifle. In 1600, just over a decade before Antonio Neri's glassmaking book was printed, former Dominican friar Giordano Bruno was convicted of heresy and burned at the stake in Rome's Campo de' Fiori market, albeit after nearly a decade of confinement and numerous opportunities to recant. Shortly before that, the inquisition ordered Neapolitan polymath Giambattista della Porta to disband his group of scientific investigators and to cease all publication without special written permission from the Church, an order with which he readily complied. Famous French essayist Michel de Montaigne complained of having books confiscated upon entering Rome, although in Florence he was welcomed with open arms by Francesco de' Medici at the Casino di San Marco, where Antonio Neri would later work. The Inquisition paid special attention to books and pamphlets because they carried the potential to 'corrupt' large numbers of people over a wide geographic area. In the Church's view, heresy was considered a disease of the mind, the devil's work. Books were seen to be a potential source to spread the infection, especially books from the Protestant quarters of Europe, but also from the 'misguided' notions of early scientific investigators. Antonio Neri was an alchemist with deep knowledge of materials that, to the unsophisticated, could easily be viewed as "magical" and therefore heretical. The last page of Neri’s L'Arte Vetraria [The Art of Glassmaking] is devoted to the official permissions that were necessary to print and sell the book. Here we read that Pie[t]ro Niccolini, Vicar of Florence (a man destined to become the archbishop) ordered Canon Filippo del Migliore of the Florentine archdiocese to review the manuscript. Upon doing so, he found nothing that "contrasts with Christian conscience." Next, it was passed to the Holy Office of the Inquisition, where the head inquisitor of Florence, Fra Cornelio Priatoni from Manza, assigned that the manuscript be reviewed by Agostino Vigiani, Regent of Servants. Final approval came from Florentine Senator Niccolò dell’ Antella. Within a few years, Cornelio Priatoni would be embroiled in the investigation of Galileo. In fact, the reviewers of Neri's glass book reads like a cast of characters from the initial investigation of the famous astronomer. The Galileo case would also include Ferdinando Ximenes, the brother of Antonio Neri's good friend Emmanuel. Ferdinando was prior of Santa Maria Novella where the inquisition was based. In fact, Emmanuel's uncle, after whom he was named, also worked in the Holy Office of the Inquisition in Florence and would later give testimony in the Galileo affair. Writing perceived to defy the Church's teaching was a serious concern for authors in Italy, even those under the protection of the liberal Medici family. Although not overtly heretical, Neri's other manuscripts could have easily fallen into this category. 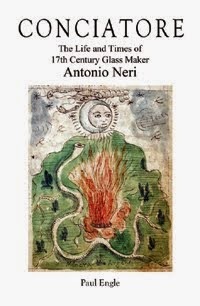 Thankfully for our alchemist and glassmaker, upon reading Neri's book, Vigiani stated "I have not found anything repugnant to the Christian conscience and good customs, but [a book] full of things and natural secrets, no less useful than curious." Neri's book went on to become known throughout Europe. Over the next two centuries, it was translated into English, Latin, German, French and Spanish. L'Arte Vetraria became an indispensable reference for scientific, artistic, and practical glassmakers everywhere. This post is based on one that originally appeared here in a slightly different form on 13 November 2013.